Liz Robb works sculpturally to create textured surfaces & woven forms with natural materials such as cotton, wool, beeswax, & indigo dye. Her work is a dialogue between the grid and the use of form, content and medium, whether it be through its threads, woven textures or influences of painting. Her sculptural forms can be compact, with intense scrutiny to detail or hang loose and cascade to the floor. She responds to the inherent properties and energy of the materials she is using and lets them inform her decisions, balancing the tension between her control of the piece and the relinquishment of control through the process. Robb began her interest in weaving after working on a farm in Wisconsin, and experiencing first hand the source of her materials. She learned how to care for sheep, harvest their fleece, & create beautiful roving and yarn. It prompted her to achieve her master’s degree in fiber arts. Having just completed a residency in Iceland, her new body of work sports the cool simplicity of black, silvers and whites, and shimmering silver leaf- which is a very Icelandic palette. Icelanders have a high regard for low processing of wool, and choose to breed sheep to be white because it is easier to sell white wool than to dye it. 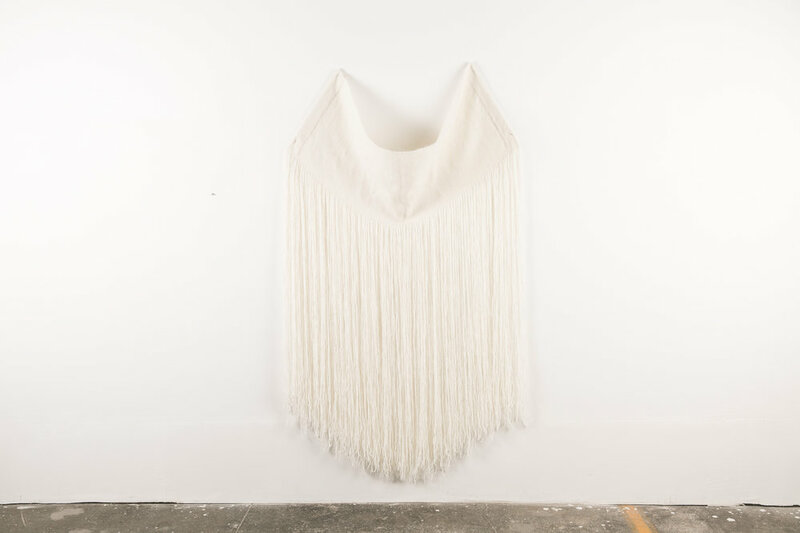 Robb’s elegant pieces recently graced the FiberSHED show at the Marin Community Foundation and with a solo show at PDX Contemporary, Portland. In March, 2016 she participated in a group show curated by Alexandra Ray, called “Hanging out” at Nido in San Francisco.